GSAT-15 ready to replace INSAT-3A and INSAT 4B KU band TV satellites. 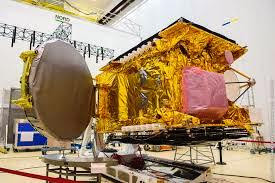 The new Gsat will provide transponder to meet the needs of DTH TV, DD freedish as well as support for operators that offer broadband VSAT internet service in India. GSAT-15 communication satellite is set to launch on November 11 and will likely to replaced the two older INSAT-3A, and INSAT 4B KU band TV satellites. Its 24 transponders are the only in the Ku band and serve DTH (direct-to-home) television first, in addition it also provide support for thousands of VSAT operators of the broadband services and DSNG (Digital Satellite News Gathering) for the TV news channels. GSAT-15 will not add new transponder capacity in the country. It will only provide much necessary sustainability to the capacity-hungry service of DTH to ensure direct to home TV sector, according to AS Kiran Kumar, Chairman of the Indian Space Research Organisation and Secretary, Department of Space. The third satellite navigation transponder GAGAN also a backup copy of airlines and other users of systems based on GPS. GSAT-15, weighing 3164 kg, will be launched at 5 am, early morning hours of November 11 (IST) from Kourou in French Guiana (South America) by the European Arianespace Ariane. The satellite launch costs and the fee is around Rs.860 million rupees. GSAT-15 will fly from Saudi Arabia with Arabsat-6B/ Badr 7 Tv satellite of Arab. This new KU band Satellite Is to be placed on 93.5 degrees East slot the country should replace the old satellites INSAT-3A and INSAT-4B one in November and one next year later. INSAT-3A, launched in April 2003, has completed its useful life of 12 years. INSAT-4B, flew in March 2007, was reduced in 2010 to half the features, after one of its solar power generation developed a malfunctioning.